We want to hear from you! Feedback will help us improve the fan experience. Is there a topic that you would like to see? Do you have questions? You can contact Janet Moore at webmaster@dorisdaymagic.com and our Facebook page is facebook.com/dorisdaymagic. Or you can leave a comment below. Thank you for visiting! Congratulations on doing our girl justice....but then you always do. I love your new website for Doris and what you and your creative group have done with it. I have loved this woman all my life and if there is an afterlife, as I believe, I will love her then as well. It's nice to see Doris now having her first American Fan Website. Unless you are a Doris fan, you cannot put into mere words the impact she has on our lives, because she is magic and very much loved. My very best to you and your team in this endeavor and I know you will continue to treat Ms. Day with the respect she so well deserves. Thanks so much Ania! Send me an email sometime. I have a couple of projects in mind that I know you can help me with. The best website ever for Doris. Love all the categories. Great Job! Your page about her 91st birthday and all the events that took place, including the photographs is lovely. I thoroughly enjoyed and was completely entertained by the video montage with the song, "I really really like you……". Made me smile. I also love seeing Doris dance. This website continues to surpass all others. Wonderful job. I would hope Doris might want to see it. Hello from Minnesota. 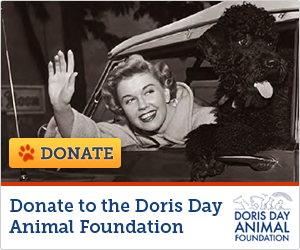 Doris is such an inspiration! I told my friend that you sing Happy Birthday to her and she said LETS GO! We both turn 60 next April and would love to celebrate by singing Happy Birthday to Doris. How do we sign up for the event?